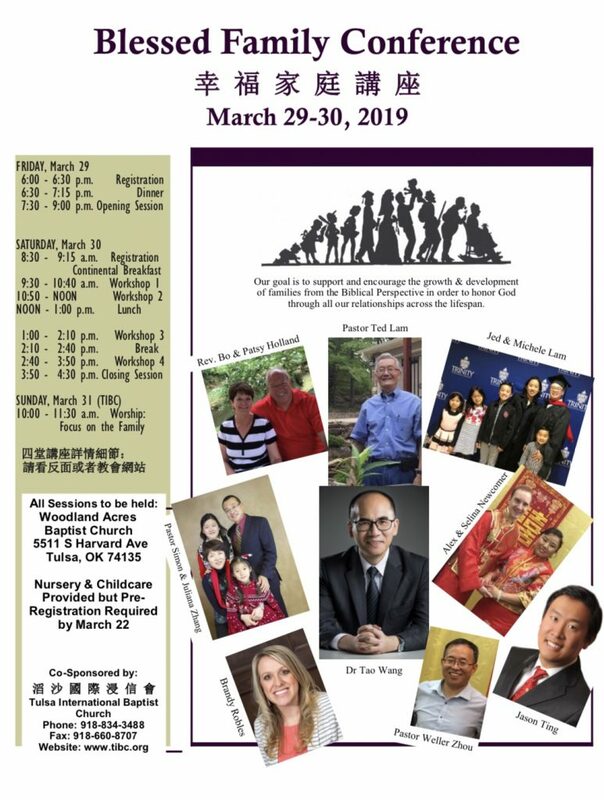 Tulsa International Baptist Church – Home of Tulsa's "Mandarin Chinese Bible Hour"
Home of Tulsa's "Mandarin Chinese Bible Hour"
NGen service is at TIBC April 14th 2019, Every second Sunday at TIBC Main. Join Us this Sunday at 8707 E 19th St, Tulsa for Worship at 9:30am. TIBC’s 5th Annual Blessed Family Conference is March 29-30th 2019, and registration is now open! Make plans to join us for a great weekend of education, fellowship, and fun. *Pre-Register before March 24th for Free Childcare and Nursery, and restaurant catered lunch on Saturday. Food Selections made after March 24th are not guaranteed. For those late or walk-in registrants, Saturday Lunch tickets may be purchased for an additional 8$ per order. TIBC has launched Daniel Ministry this year in 2017, a ministry targeting business individuals and helping them conduct business in a Christian manner. Daniel Ministry will meet formally every two weeks. For more info, visit the daniel ministry website. TIBC is taking part in many new ministries, and we need you! to get involved. If you’ve been thinking about serving in a church, or being a part of a new ministry, please pray about and consider being a part of our new ministries. Blessed Family Conference was a success. Make plans for next year to attend! 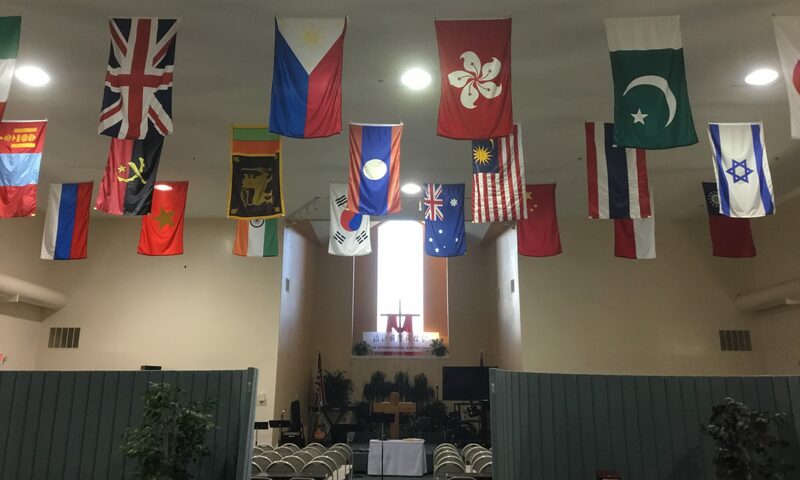 Simon Zhang Liang ordained as Associate Pastor and will lead the Mandarin speaking ministry. 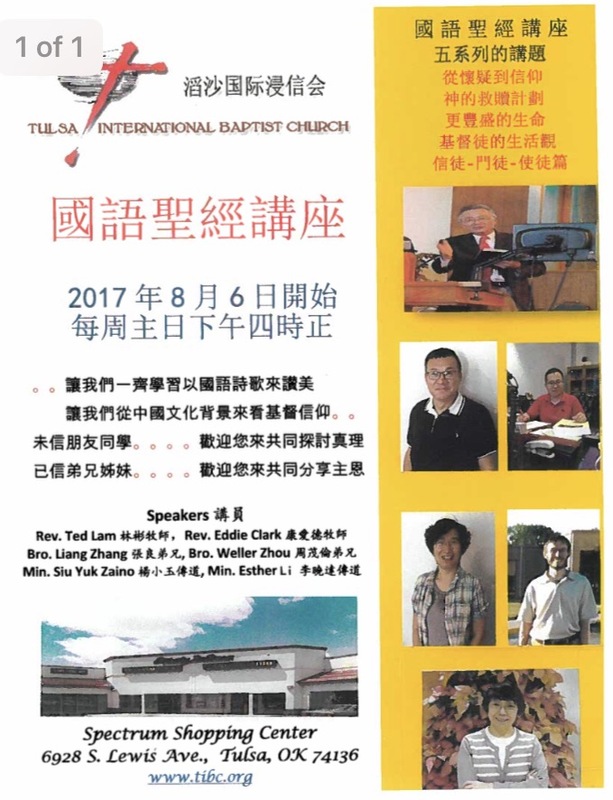 Mandarin Bible Hour starts this Sunday , July 30th at 4pm, 6928 S Lewis Ave.
www.TIBC.org is undergoing a makeover, but visit us at Facebook.com/newtibc , and come back to visit us online when our new site is online later this month. 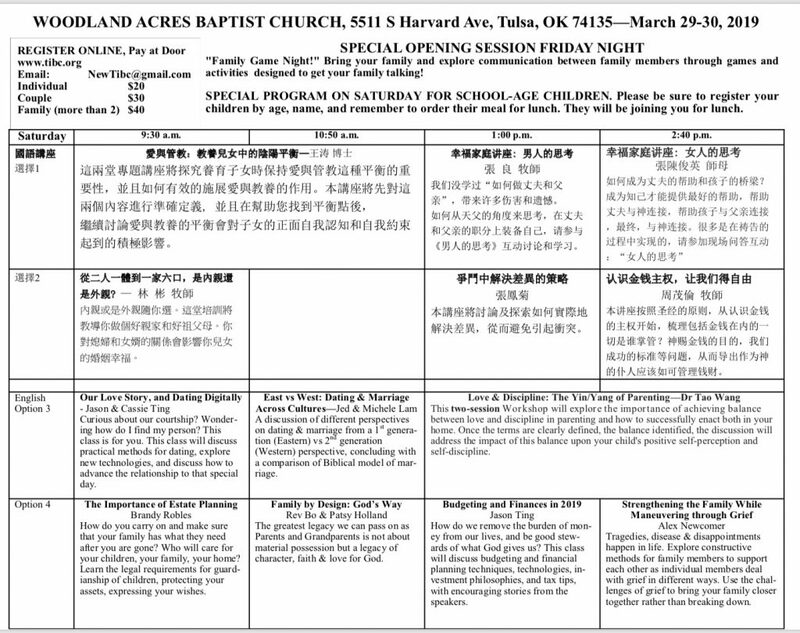 Mandarin Bible Hour in South Tulsa Every Sunday starting July 30th 2017, 4:00pm at Spectrum Shopping Center 6928 S Lewis Ave.
Friday Night Fellowship Dinner at 630pm at 8707 E 19th St.
Wednesday Night Prayer Meeting at member’s homes (rotational).